Helping other people make money is big business (eBay is a pretty solid example of this). SnipSell is one of the latest startups to operate under the “we make money when you make money” model. 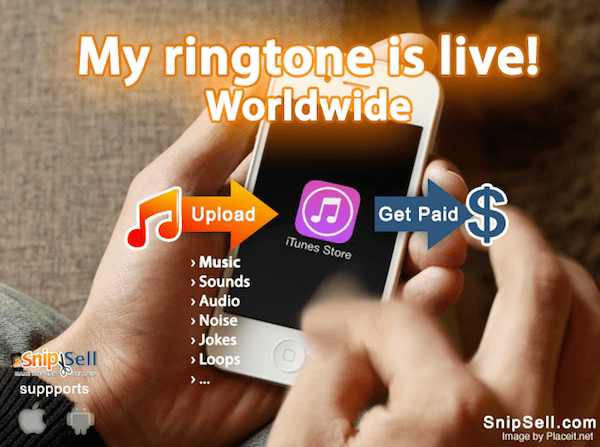 Snipsell.com is branding itself as the number 1 online network for selling ringtones that people create themselves. SnipSell is a dream come true for sound engineers, tech-focused musicians, and ringtone enthusiasts. The site gives users a platform to easily upload the ringtone they have designed (as long as copyrights haven’t been infringed upon) and get the tunes onto a marketplace where people will buy them. You’re not just getting access to a couple of customers, SnipSell gets the sound file you designed onto iTunes, which in effect gives you access to over 700 million devices looking for cool ringtones. If you’re in the market to sell some jingles you’ve been working on then things just got a whole lot easier for you. SnipSell’s model seems to be built on straightforward service without any unnecessary fuss. In about five steps users can turn their GarageBand project into money. Create a cool sound file using software like GarageBand, Audacity, Logic, etc. When it comes to getting paid users have two options. For a flat (annual) fee of $19.99, users get to keep all the money their files makes on iTunes (which would be a buck a download). There is a free option too though, which lets users keep 50% of the profit, with the other half going to SnipSell for being awesome and hooking you up with iTunes. The digital music industry is massive, which is both exciting and terrifying if you think about it. Sites like SnipSell are helping users carve out a niche for themselves and provide them with a solid way to make some money off of the music, jingles, or sound effects they come up with.